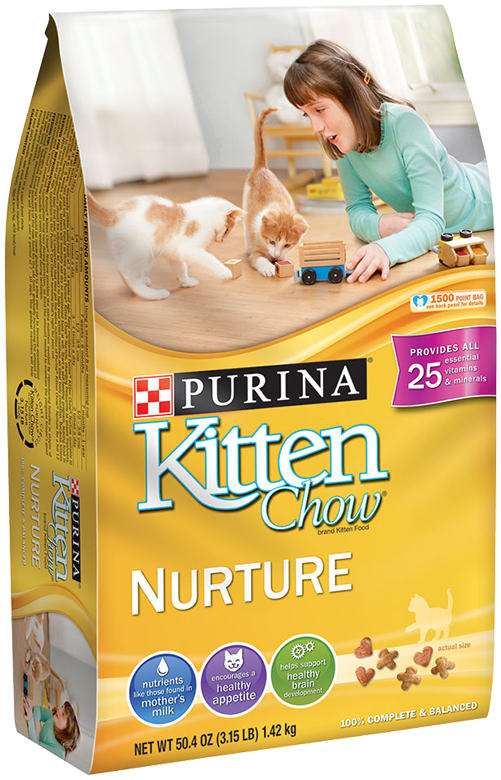 Purina® Kitten Chow® Nurture is an age-essential, dry kitten food made with the four foundational Building Blocks of Nutrition: high in protein for developing lean muscle; DHA for brain and vision development; essential nutrients like those found in mother’s milk; and antioxidants for strong immune health. Every meal also provides the 25 essential vitamins and minerals cats need at any age. Plus, it’s formulated with a taste kittens love – and without artificial colors or flavors – to help give them the nutrition they need while they develop. 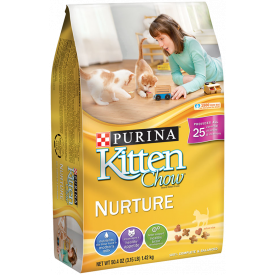 Purina Kitten Chow Nurture is formulated to meet the nutritional levels established by the AAFCO Cat Food Nutrient Profiles for all life stages.